Starbucks has the Thanksgiving blend out! Oh, don’t you just love it? The blend, yes, but mostly the holiday! I love Thanksgiving. There is nothing quite like the practice of giving thanks, praising God, and celebrating life’s good gifts. As I’ve been thinking about the holiday season approaching, I am reminded of the Apostle Paul’s words in 1 Thessalonians. Paul wrote, “Be joyful always, pray continually, and give thanks in all circumstances” (1 Thessalonians 5:16-18). I love this verse so much that I have it as a wall hanging in my house. It’s such a beautiful reminder of the type of attitude that God wants me to cultivate. Be Joyful. You might be thinking, “Well, how can I possibly be joyful all the time?” Notice Paul doesn’t say “Be happy.” He says “Be joyful.” Joy is tied to our relationship with God. Research has taught us that the joy center of the brain begins to develop in infancy when a baby sees parents’ eyes light up because they’re so excited to see their child. There is a chemical reaction that takes place in the child’s brain, and the joy center is strengthened. The great news is that your joy center can continue to develop all through your adult life. As you begin to realize and experience that you are the sparkle in God’s eye, your joy center is strengthened. Isn’t that amazing? In other words, when you come into God’s presence, His eyes shine because He’s so excited to see you. As you realize how deeply He loves you and how excited He is to spend tine with you, your joy center is strengthened. So this holiday season, before you even get out of bed in the morning, whisper a prayer that goes something like this: Good morning, Lord Jesus! Thank you for loving and delighting in me! I’m so excited to spend this day with you! Pray Continually. Learn to cultivate a continual conversation with the Lord. This is a tip for living a life of thanksgiving, not just during the holidays, but all year long. 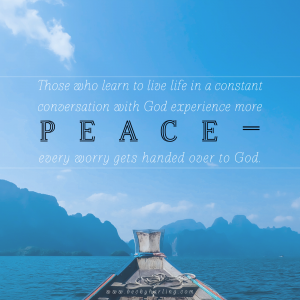 Those who learn to live life in a constant conversation with God experience more peace because every worry gets handed over to God continually. On one level, life is lived and problems are solved, but at another level there’s a continual dialogue taking place with the author of all wisdom. That conversation becomes the undercurrent for a thankful life. Give Thanks in All Circumstances. No matter what challenges you face, find something to give thanks for. You don’t have to feel thankful for all the difficult things God allows in your life, but you can always find some aspect of God’s character to be thankful for. It can be helpful to write down the things you are grateful for. Keeping a thankful list will remind you of the little things in your life: a beautiful sunrise, fresh hot coffee in the morning, a snuggle from a child, or a listening ear from a friend. As you practice giving thanks no matter what’s going on in your life, you will gradually become a more grateful person. As Thanksgiving approaches, why not prepare your heart by using these keys to unlock thankfulness in your heart? We have been going through some dark days with my son’s stage 4 cancer. But even in the hardest days the Lord has always provided something or someone to lighten my heart and give me joy – the squirrel who visits our garden and who I see from the kitchen window is a regular giver of joy. Our family may not be thankful for the cancer but we are thankful for the times of togetherness and laughter we have shared together and for the little joys that every day brings.